Discovering this children’s book by well-known author MacLachlan is finding something I thought was impossible: an exquisite and sensitive book written at the ‘early reader’ level. 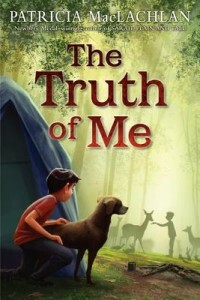 After reading The Truth of Me, I realize that a quality children’s book isn’t based on having complicated words and sentences, or even a complicated plot. Rather, the quality comes from offering sincere, heart-felt interactions among people who represent the best in life. The language itself, like the language of the heart, is clear, simple, and direct. I love the way that this children’s book mixes humor with a serious inner dilemma. It is not uncommon for a child to feel unloved by a parent- whether it’s due to another sibling, a career, or anything. This book addresses that issue, and resolves it, without ever lecturing or creating a confrontation. All along, we just feel the sensitivity of helping a child cope. The grandmother in this story is the heroine, as she completely understands her grandson’s feelings and needs. I hope every child has a grandparent in their life like Maddy, one who can see them for who they really are. I imagine this children’s book could also be read aloud to a younger child, say 6 or 7. However, I think it’s real gift is providing a serious and thoughtful book for those newly independent readers age 7 to 9. This is a beauty, from start to finish. I can’t wait to read more by MacLachlan. For another beautiful book by the same author, see Fly Away.